US President says Democrats are anti-Israel and anti-Jewish and "it's a disgrace". 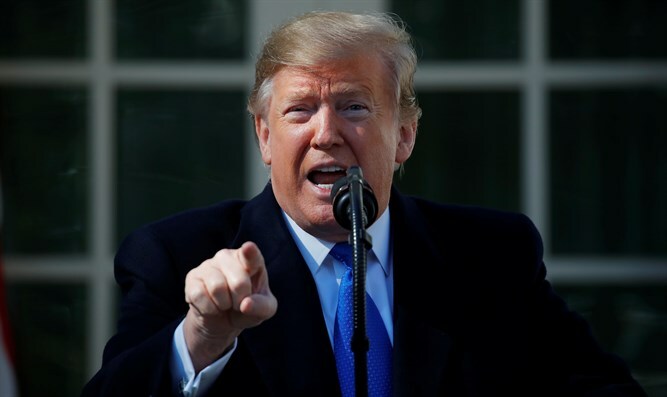 US President Donald Trump on Friday repeated his claims that Democrats are “anti-Israel” and “anti-Jewish”. Trump made similar comments two weeks ago, after the House of Representatives passed a broad resolution that called out bigotry of all kinds without directly condemning Rep. Ilhan Omar (D-MN) over her anti-Semitic remarks. The resolution approved by the House originally condemned anti-Semitism but was rewritten and its final draft was expanded to condemn all forms of bigotry, including white supremacy. Republicans characterized the watering down of the resolution as a ploy to distract from Omar’s remarks which had prompted the resolution in the first place. Trump’s statement was made in response to a reporter who noted that several Democratic presidential candidates have decided not to attend the AIPAC policy conference in Washington, DC, next week and that Trump is not making an appearance there either. While Trump will not speak at the AIPAC conference, he will meet with Prime Miniister Binyamin Netanyahu at the White House.